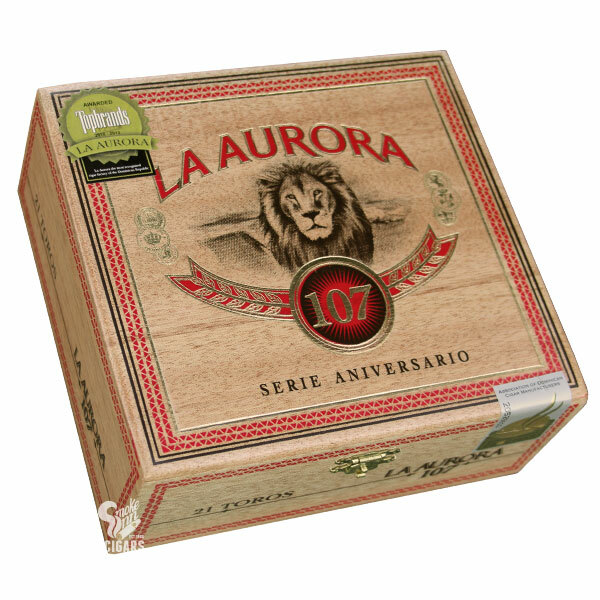 Buy La Aurora 107 Cigars Online! With well over 100 years experience in the art of crafting premium cigars in the Dominican Republic, the La Aurora name is practically synonymous with “Dominican cigars” among enthusiasts. Indeed, the company was established in 1903, making them the oldest operating factory in the Dominican Republic! La Aurora commemorated this tremendous feat in 2010 with the introduction of the La Aurora 107—which, at the time, showcased the age of the legendary factory. The cigars have remained a staple in enthusiast’s humidors ever since, showcasing the quintessential Dominican experience and an added complexity derived from a diverse filler blend of four countries! A sun-grown wrapper from Ecuador surrounds a Dominican binder (grown in the famed Cibao Valley) and a healthy mixture of filler leaves, which have been aged six years prior to rolling. The end result is medium-plus in body, offering sweet and floral notes that are backed by more robust elements of leather, fresh wood, and black pepper. This is a modern classic that should be in regular rotation to keep your “Dominican side” satisfied!